The penultimate day of play, Saturday 14th April, at the Gold Coast 2018 Commonwealth Games started with sheer drama as the Mixed Doubles finalists were decided, both semi-final contests went the full five match distance. True to tradition, the day ended in a similar vein; England’s Paul Drinkhall and Liam Pitchford, the no.2 seeds, won the Men’s Doubles title, overcoming India’s Sathiyan Gnanasekaran and Sharath Kamal Achanta in the final; a tension packed win in five games (11-5, 10-12, 9-11, 11-6, 11-8). In fact it was a contest the English duo won five-nil! After securing the first game, they led 10-8 in the second and then promptly lost the next four points; then in the second they went ahead 9-6 and lost five points in a row. 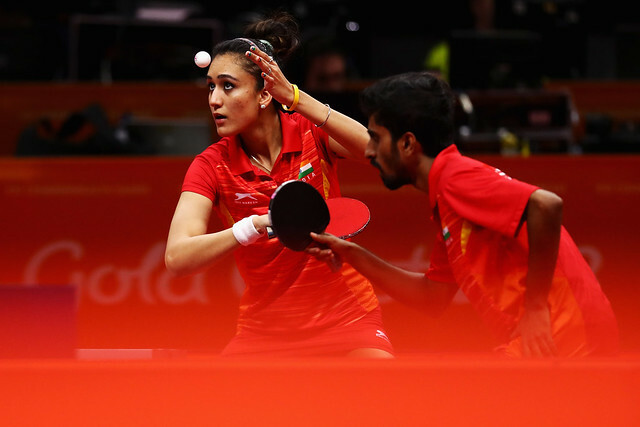 They dominated the fourth game but when the Indian duo recovered from 9-5 in arrears in the fifth game to 9-8, one wondered if there was to be a repeat of the second and third games. It was third time successful, Paul Drinkhall and Liam Pitchford won the next two points; England celebrated; nobody more so than coach Marcus Sjöberg, he leapt for joy; you would have thought he was standing on white hot charcoal. “We were losing two-one but really we were ahead three-nil; we felt we’d won those first three games so if we kept playing the same then we knew we could win.” Liam Pitchford. Silver for India, it was also bronze. Harmeet Desai and Sanil Shetty, the no.4 seeds, beat Singapore’s Pang Yew En Koen and Ethan Poh Shao Feng to reserve the third step of the podium (11-5, 11-6, 12-10). A bronze medal for Sanil Shetty, something he never expected two weeks ago; he was the last minute replacement for the injured Soumyajit Ghosh. Play concludes on Sunday 15th April with the medal matches in the Mixed Doubles and Men’s Doubles events.